Today as I headed out to my hair appointment my hairdresser texted that she would be running late. What is a person to do when you get that message? 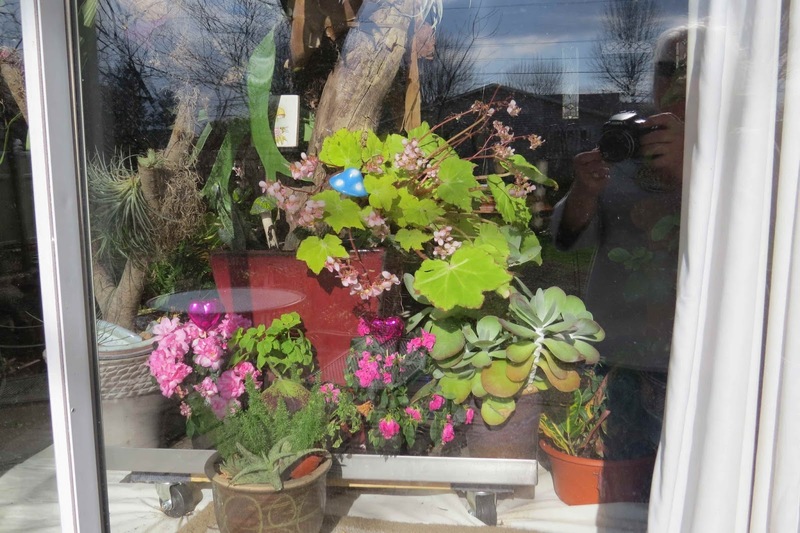 As a gardener on a cool spring morning you head for the nearest display of plants available. 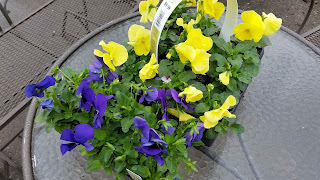 Yep, no self respecting nursery around here has much to offer this time of year but the local big box store has plenty of pansies and small shrubs etc. I must say I did succumb even though it was spitting rain. After all the weather watchers say we aren't going to have any frost for the next 10 days or so. 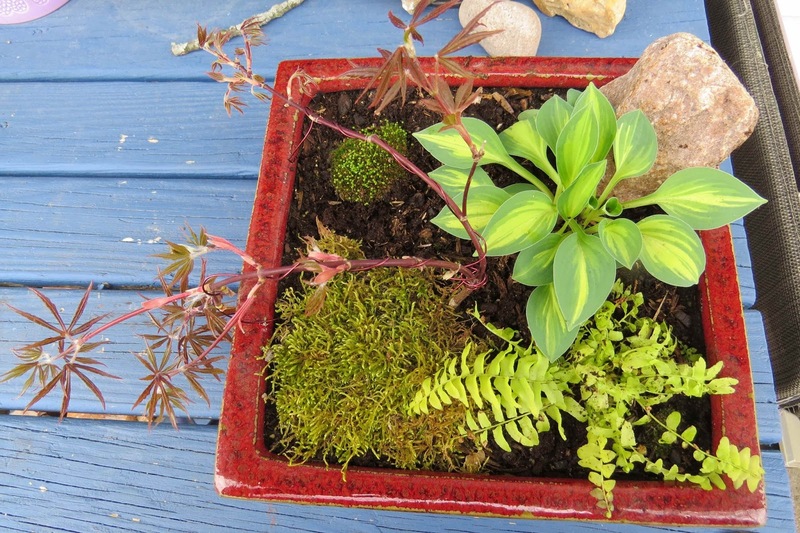 While there I also picked up a magazine MINI GARDENS & TERRARIUMS. I thought I could sit and read until called to the shearing chair. I just got started reading this magazine when I came upon a picture showing a small Japanese Maple in a box being trained as a bonsai. It had moss and rocks around it. Oh be still my heart. 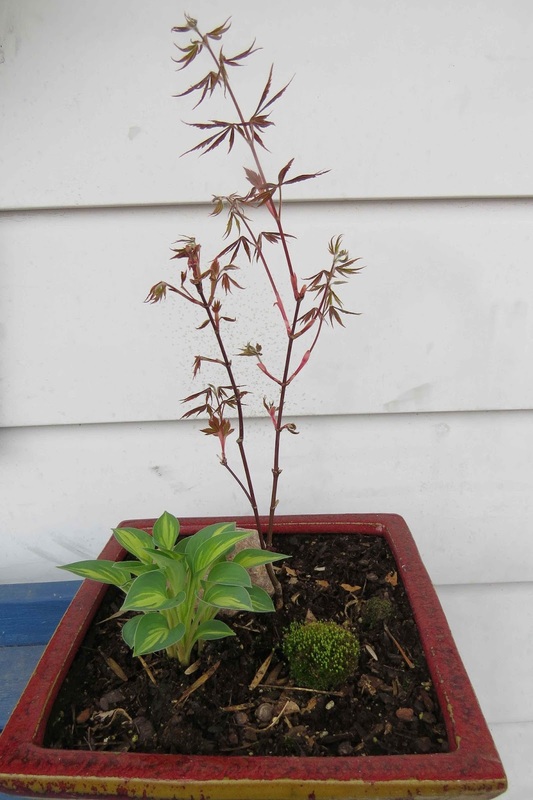 This reminded me of the small Japanese Maple that I nursed through last summer. When early winter came along I stowed the pot in the the window well that leads to our crawl space. I thought it might survive with a bit of protection. 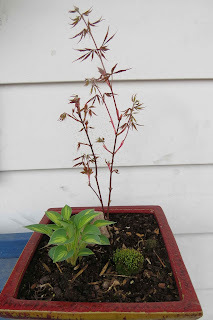 I couldn't hardly wait to get home and check on my little maple with it's mini hosta and moss. 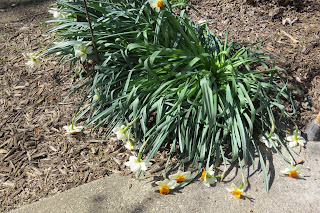 As you can see the little darlings survived and thrived. This is the only tree in the garden with leaves. So I can say it is a bit warmer in there sort of like a greenhouse. With the picture in the magazine as an inspiration I wired the little tree into a cascade. It being so small it was easy to do. As you can see I added a small fern that I bought this winter that is supposed to stay small. It looks larger in the pot than I imagined I can always take it out if it gets too big. Have you ever tried bonsai? I have always admired the small trees, plants, moss and rocks that all are part of the whole scene. 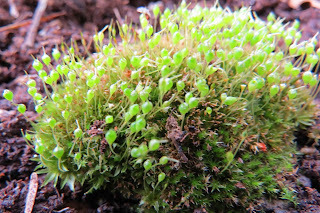 I have no idea what kind of moss I have in there. The clump of moss that has the spore capsules is a dark green. It has been in the pot as long as the tree and hosta have been together there. 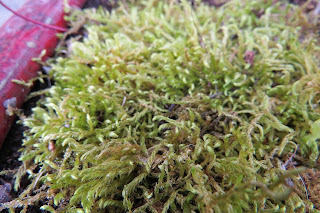 The flat moss, which is larger and a lighter green, is a piece of moss that I collected not long ago. I hope it likes it's new home. 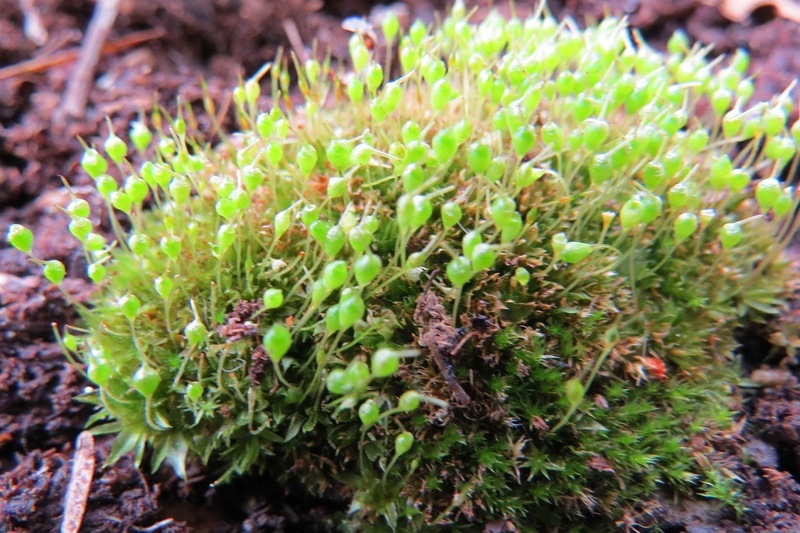 Do any of you have an idea of what kind of mosses I have here? I would like to hear your thoughts about my little bonsai start. I don't know what I am doing even though I have read about the process. I decided to go for it. We will have to wait to see what happens now. It is just that time of year. 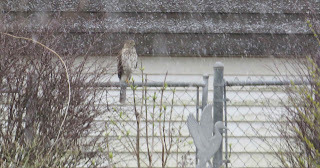 I woke to a snowy surprise this morning. I knew it was going to get cold, like it 'felt like' 5 this morning, but I didn't realize we were to get a dash of snow. Enough to make things looks a little saggy. 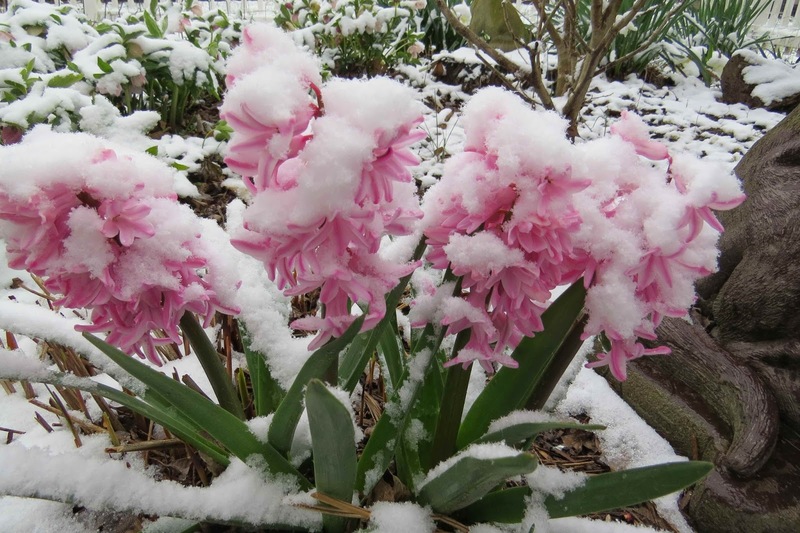 As you can see the main bloomers are all snugged into the snow. It didn't take long for the sun to melt the snow and warm up the atmosphere. 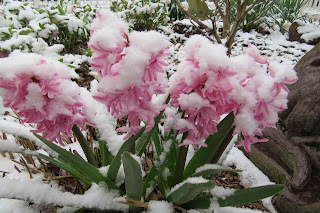 The hyacinths weren't too impressed. 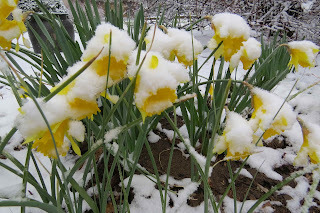 And these narcissus weren't too happy. 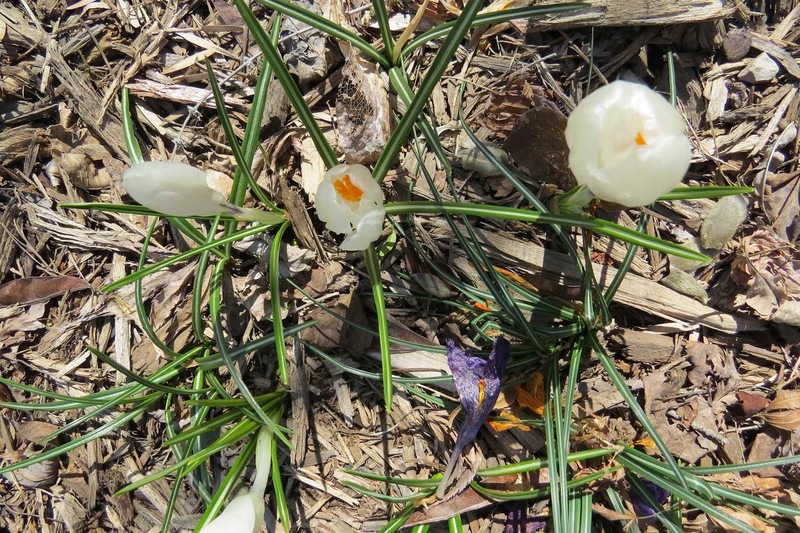 The white crocus were just about coaxed into blooming. 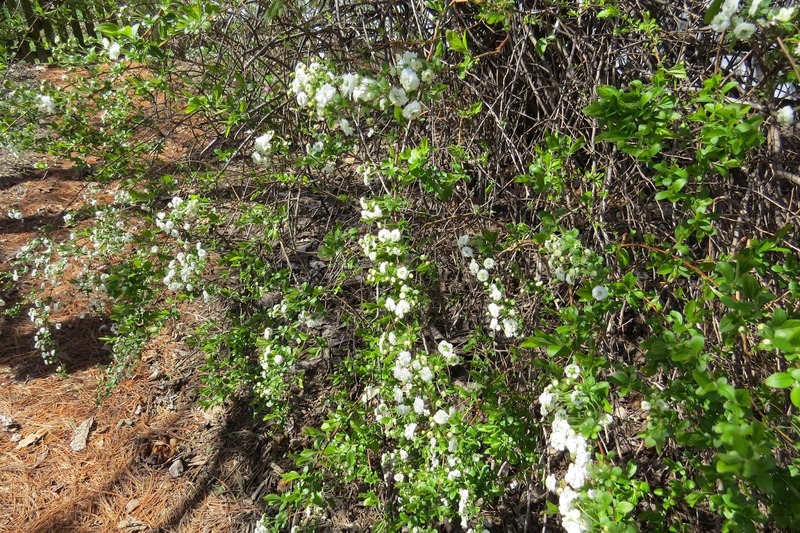 Right around the corner the spirea was all abloom as it ever is. It sits under the Magnolia tree where it doesn't get enough sunshine but it takes advantage of all it does get. The poor Magnolia didn't get to bloom this year. I won't show you the carnage. It is too depressing. 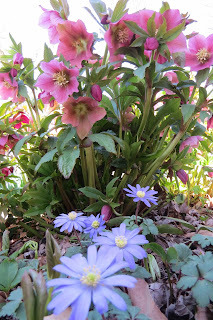 The windflowers and some of the Hellebores are also protected. As we stroll by the patio doors you can see that inside there is a bloom or two. The Lime Begonia is still blooming although not as profusely. The tiny azaleas that were a gift to me are still abloom. One isn't too happy but it has color. 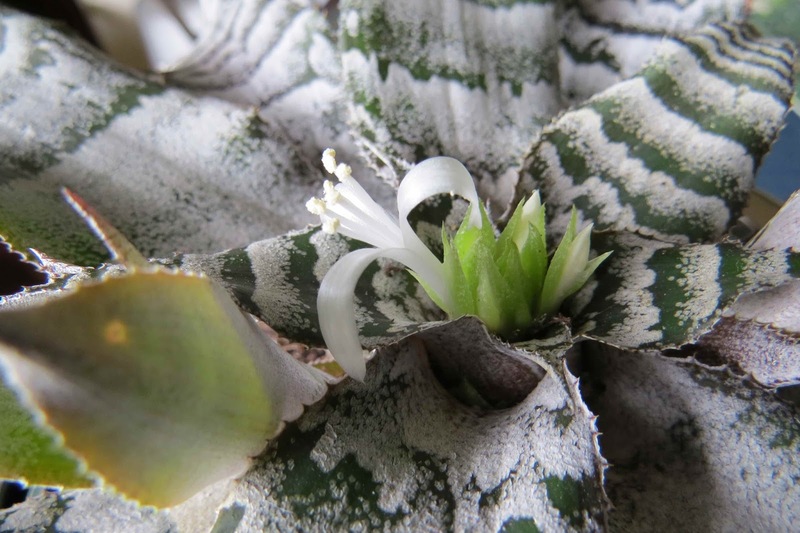 Speaking of indoors...this bromeliad is blooming! 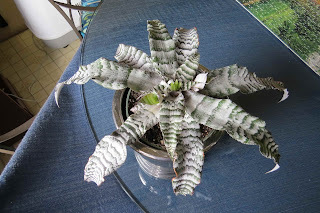 It's a new plant for me. I have only had it since this February. It looked awfully dry when I bought it. I gave it a good drink of rain water. It repaid me with several of these beautiful white blooms. It's name is Absolute Zero but she is a perfect 10 to me. What do you have blooming today? Please do tell and join everyone over at May Dreams Garden where Carol encourages everyone to share their blooms on the 15th of each month. Since they predicted snow for today I got out yesterday and picked a couple of bouquets for a vase today. I found that these don't smell quite as good as the vase of daffodils last week. They are a cheerful lot though. 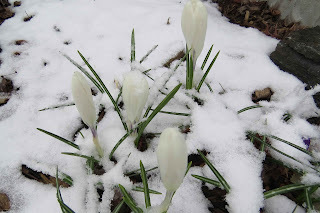 I wish I had brought in many more of these cheerful faces since it is snowing this morning. 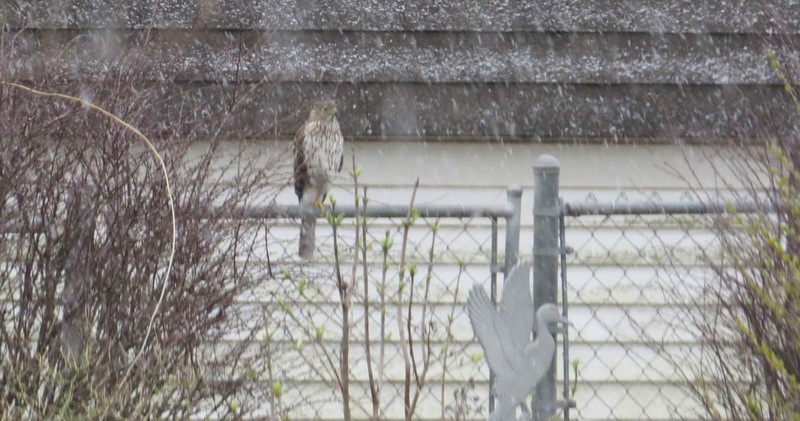 I am like this Cooper's Hawk. I am sitting here this morning with my feet tucked up under me. Thankful that I have a nice warm home and plenty to eat. 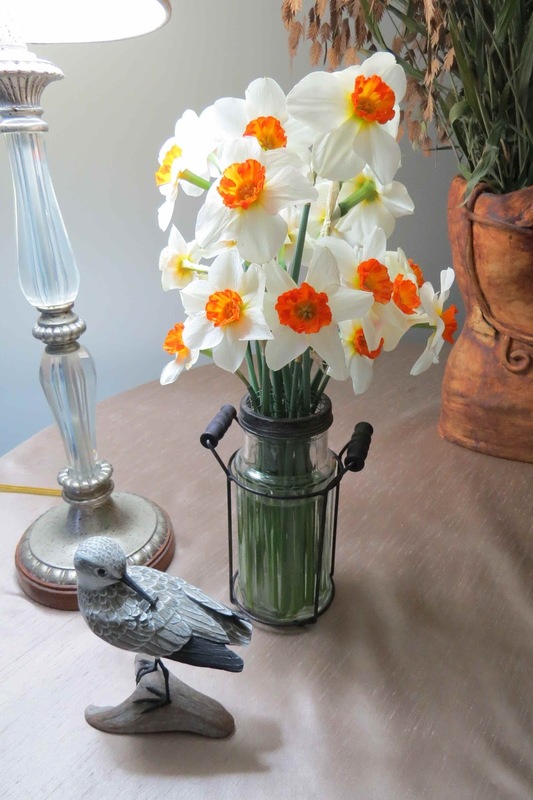 Able to stay inside and enjoy these small vases full of nature's bounty. If you are in need of a cheerful vase full of flowers pop over to Rambling in the Garden where Cathy holds this delightful meme. I actually have enough flowers to have a vase full for this Monday. Cathy over at Rambling in the Garden has this meme every Monday. 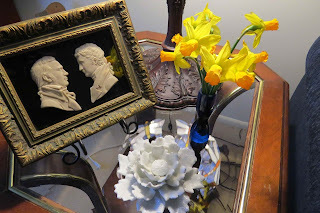 It is fun to see what is in everyone's vase on Mondays. I haven't had much to show this winter but others sure have. 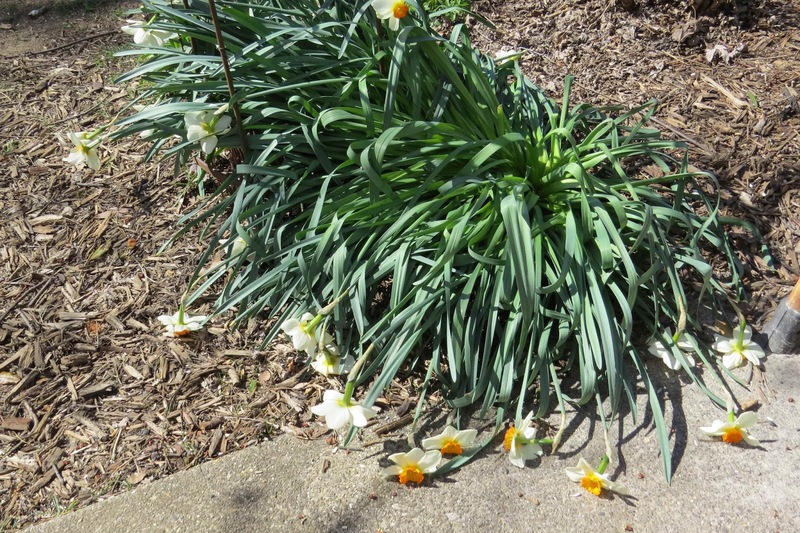 These daffodils were given to me so I don't know the variety but they are very prolific. I have a very good stand of them. If anyone knows the name of this variety I would sure like to know. They are blooming early this year. The reason why they look so short is that I only cut the ones that the wind blew over. The wind is probably going to take care of the rest of them tonight as a severe storm is forecast for the area. Do you have any blooms for a vase today? Some people have all sorts of beautiful greens and things for their vases. 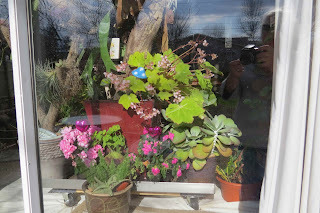 Why not join in and show what you have in your vase now. 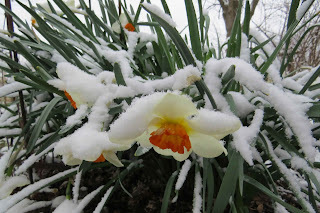 Over at Veg Plotting she is having a picture day today and tomorrow for those who would like to share how their garden looks this time of year. You can go here if you wish to participate go here. She said one picture. I had a difficult time trying to decide just where in the garden to take this shot for the day. 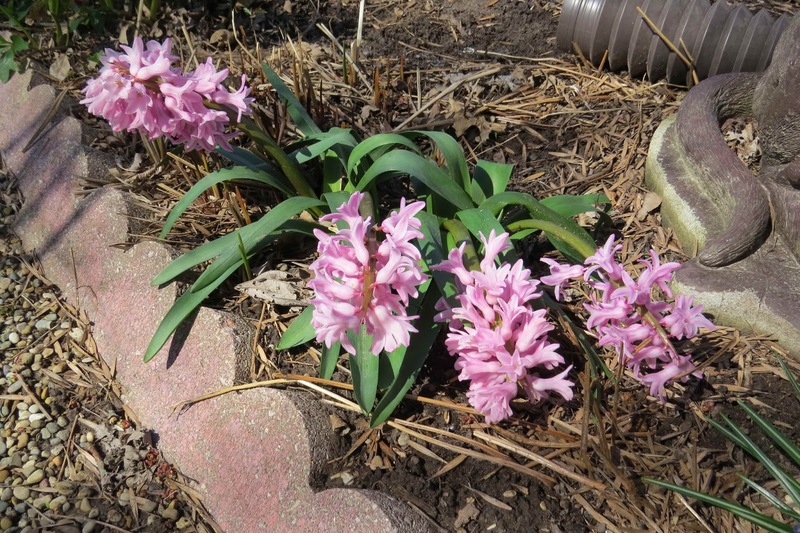 So I am going to show you two places in my garden that is coming along well for this time of year. As you can see my small veg plot isn't doing anything as yet. During February when we had some spring-like weather we got the leaves all turned into the raised bed and it is raked over ready for some peas and lettuce. Here I am in the middle of the back garden. This flower bed is what I call the OVAL GARDEN. All my flower beds have a name. If you notice the bed looks fairly empty except for some hellebores, windflowers and a few shrubs. The Dappled Willow on the left of the picture is just sending out some green and has little catkins on it. The Hinoki cypress Thoweil in the background is showing some light color on the ends of it's branches. I wish I could show you that up close. It is so pretty. The planter that I have my hand on was just moved here in February. 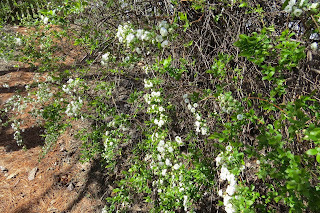 It has three small shrubs growing in it. They needed to get out of the planter so I moved one of them into the garden. I moved the sweet little shrub you see in the foreground in front of me and the hellebores to this site. 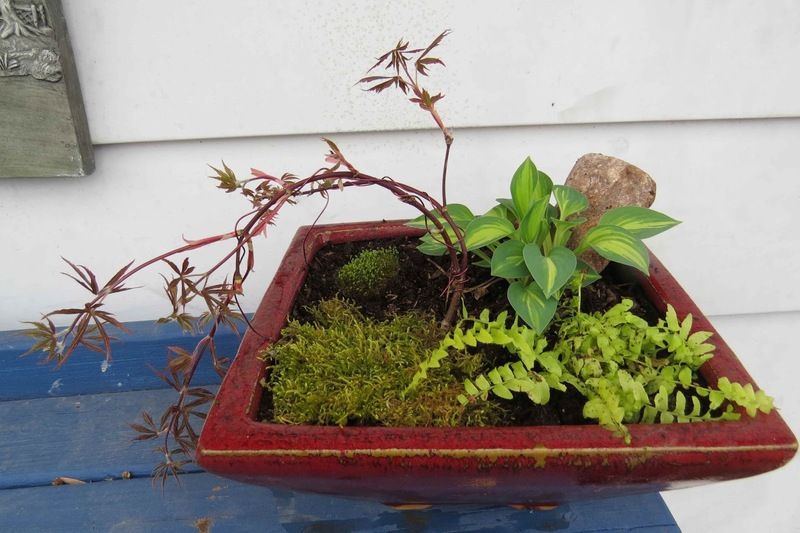 Then I planted the other shub in the planter that had held the one in this picture. Are you perfectly confused now? Well, sometimes I get confused too. As you can see though there is a lot of greening and growing into that needs to be done yet. Don't let that sunshine fool you. It is quite cold with the wind blowing here. 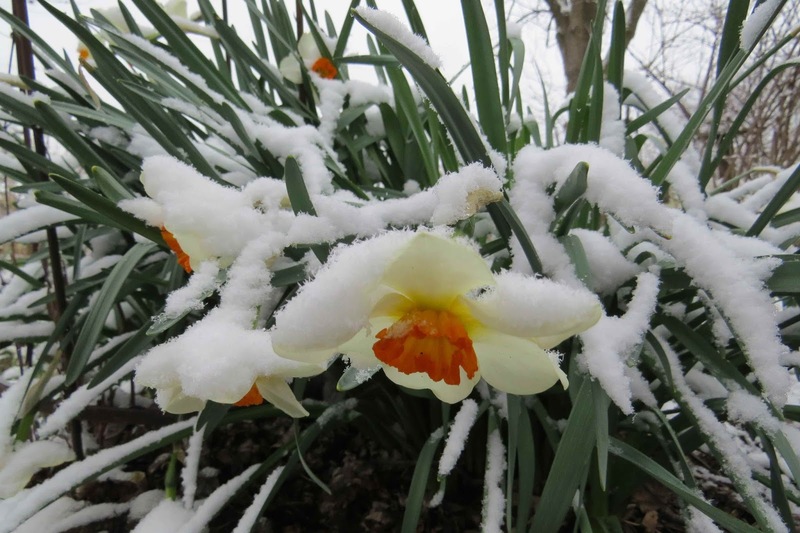 So what does your garden look like right now? ?